So you have decided on aquiring a house, let me be the first one to congratulate you on that! :) House is very important in your Obsidian Shard experience and you will soon notice what a great... blablabla... I'll just stick to technical details of house management. House deeds are sold at NPC Architects. Currently they can be found in Britain, Trinsic, Wind and Cove. Just ask some passerby, he'll most likely point you to the building where architect resides. But don't be hasty about it - find a spot for house first. Try to find one close to your areas of interest (hence "don't be hasty" - gotta figure what your interests will be) and/or close to runestone chamber exit or a moongate. Make sure you will be able to place a house of your chosen proportions at the place you chose. You don't want some tree sticking through the floor (usually wouldn't be allowed to place a house anyway) or getting your house deleted just because you didn't read the rules and blocked some pathway, heheh. Also try not to overlap your house area with the houses already placed nearby. That might lead to some unexpected results and hinder your (or their) house usage. To sum things up, make a careful pick and only then buy. To place a house, just dbl click a house deed and target click where you want it to be placed (you'll be presented with an outline, so don't worry). Also, you can always just press Esc to cancel the house placement process, in case you decide that isn't a place for you or are simply not able to place it at that particular location. In order not to place a house on yourself (in which case you'd get stuck) your screen will go black if you try that, so choose your standing position to the side of where the house is supposed to go. After placing a house you end up being an owner and master key for that particular house is placed in your backpack (a copy of it will be in your bank box). You can rename master keys by dbl clicking and targeting it then entering name and pressing Enter. Also, if you find it convenient you can buy key ring from NPC Tinker and put your master keys on it (just drag the keys on it, dbl click and target key ring to remove keys from it). Bought from NPC key rings are newbied (meaning they can't be looted off your corpse, same goes for the keys created upon house placement and through house sign menu) and can lock/unlock doors by simply using a key ring on them if the master key for that house is inside. The drawback is that you won't be able to lock/unlock items from your house area with only a key ring, you'll have to remove keys from it and use apropriate one for that. To get inside your house you need either a door key (must create it through house sign menu) or you can simply use an in-game open door macro. However for an open door macro to work the door can't have a door key used on it earlier. So make sure you really want that if creating a door key. A macro will open/close the door if the door is unlocked (lock/unlock it by using a master key on it) or if it's locked you need to have a master key present in your backpack. Another good this is that door will auto close in 1 minute if you're using an open door macro instead of a door key. However if you're thinking of sharing a house with someone or more importantly, just letting them use your house temporarily, you're better off just creating door keys, because you can always just change locks and create new door keys to deny them access inside your house. While master keys (which you'll have to give them to let them open doors) aren't affected by "change locks" command and are for life (it's also possible to make duplicates of master key with tinkering skill). It's your call, but be careful who to trust. Okay, currently a house can have 1 owner, 1 co-owner, 2 friends and unlimited number of ppl with the keys to open door and use house space except accessing the secure containers. Friends are able to access secure containers. 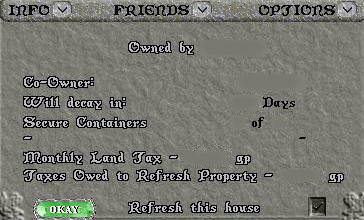 Co-owner can pay the taxes, add/remove friends, kick some imposter from the house, add/remove/access secure containers, rename the house (co-owners can't use rename crystal atm it seems) and use an option for removing house crystals from his pack (those are items used in house renaming). 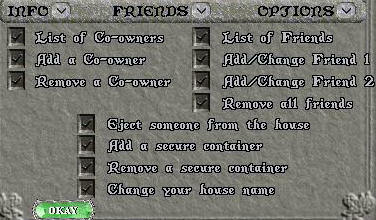 Owners, in addition to all listed, can add/remove co-owner, transfer ownership of a house (careful with that, as you don't want to transfer it to some NPC critter), change locks, create keys and change house sign. In order for your house not to decay, losing all the items inside, you need to refresh it (use refresh option in house sign menu) wihin 60 days from the last refresh or within 30 days from house placement. As mentioned before, only owner and co-owner can do that. If you fail to refresh it in time, your house sign will disappear and the house will be flagged for deletion. Which will happen when the cleaning script is next run or some passing staff decides to remove it. Decayed house removal script seems to be innitiated manually, so you may or may not have up to few weeks to try to get your house back. That would need you paging in-game explaining the situation and asking staff to fix it. No guarantees there, though. This is the first pane "Info" which everybody will see including friends of the house (except for "refresh" option, which is only available to owner and co-owner). It will tell who the owner and co-owner are ("0" if none), how many days are left till the house decays, how many secure containers are placed out of the number available for that particular house type, what the montly tax rate is and how much would need to be payed if it was chosen to refresh now. "Friends" pane lets you manage co-owner and friends. Choosing "Eject.." option will bring a targeting cursor to target a person inside your house for him to be placed at the location of the house sign. After choosing "Add secure container" option you'll have 10 seconds to walk into a position where you want a secure chest to appear and double click the deed that'll be placed in your backpack. Bear in mind they come aligned looking south (called north orientation) and won't look very well if placed at a west/east wall. If you screwed up in placing a secure chest, next option will let you target a secure chest for removal. Also when placing a secure chest try to place it so that it couldn't be accessed from outside of house area, as doing that will make it disappear (uh oh). To change the house name, you'll have to dbl click the crystal put in your backpack and add letters one by one through the menus, then target your house sign after finished. Be it you decide to abort the naming, just use the last option in the "Options" pane. Last "Options" pane is for owners mainly. Transfering house will require you to target whoever you're selling/giving it to. Selling houses that way will require to rely on trust, which isn't always a factor in anonymous online games. And though such scamming doesn't seem to be tolerated, just to be sure you could try paging and asking a Counselor for help as a middleman in such operations. Creating keys will simply place the key in your backpack. Their newbied ability won't help if you won't keep the keys in your main backpack, as the bag in which you might want to put it won't be newbied and could get looted off you upon death. Changing house sign will allow you to choose the sign appearance you want from the given list. Changing locks will make current door keys useless. It won't however allow you to use open door macro to open/close door, so you'll need creating door keys again. NPC Architects also sell a variety of deeded items that some will find useful. Some of them and items not sold can be made by player carpenters. Deeded items are usualy placed by standing on the tile where you want it to appear and dbl clicking the deed. Where it matters, deeds will have "North"/"West" added to their name. That shows the orientation of an item, near which wall it should be placed or which way it's "back" is gonna be turned. You will not be able to move most of deeded items after placing, so choose carefully. What isn't the case with a trash can, hence make sure to lock it down, as ppl find it amusing stealing them. Important addition of your house might become a guildstone, cause those can be placed only inside a house area too. Wheather to place it outside the house, for others to see, or inside, to limit access to it, is up to you. Also, might want to read guild info for help on managing it. Then there're items not available through crafting/NPCs and only sold by GMs, like a loom or an ATM Chest. If you ever need one, try paging asking to buy one, they should cost ~20k. Surely you'll want to decorate your house too or simply put down a normal chest/bag for keeping items for characters not added to the friends list. Be sure to try out a .flip command on various items. It will make most of them change direction/appearance, letting you fulfil quite awesome decoration projects. Which will look even better if you're going to use temporary stacked tables (and other items) to control placement height of decorations. And for someone not to run off with your items (items from normal containers can still be taken by anybody no matter what) you'll want to lock them down. For that the item must be inside a house lock down area and you must target it after dbl clicking your master key while yourself standing inside house lock down area too. Don't miss that, cause you'll think you locked it down just to find it missing some day. Easiest way to check if you're inside a house area is to type a .where command. If you're inside it, the type of the house will be written in parenthesis. Move around saying .where command to get a feel of it or just check house info (below) which has the lock down areas listed for available house types (click on a house picture to see layouts for different levels). Take note that in addition to being able to lockdown items, even unlocked items won't decay inside a house area (that includes the house interior of course). Another thing to keep in mind is that some items can still be taken/used when locked down. That includes shrunk animals and stackable items. And be careful about leaving items where others can get below them, as ceiling and floor doesn't stop you from accessing items on other levels, unfortunately. If creating a rune library, keep in mind that you won't be able to use them while locked down. House will also be where you'll place your vendor to sell your items to other players. As with all such deeds just stand where you want your vendor to appear, dbl click a vendor deed (buy it from NPC Tavernkeepers) and target a house sign. Again, you have to be inside your house area. Don't miss vendor info if you decide to take role of a merchant. And don't place vendors inside a house unless you're going to keep it open at all times, as others won't be able to buy goods off them through walls. Additional lock down tile rows, counting from the house walls: 0 South, 1 West, 1 North, 0 East. Additional lock down tile rows, counting from the house walls: 6 South, 5 West, 5 North, 4 East. Additional lock down tile rows, counting from the house walls: 2 South, 1 West, 1 North, 1 East. Additional lock down tile rows, counting from the house walls: 6 South, 5 West, 5 North, 6 East. Additional lock down tile rows, counting from the house walls: 3 South, 3 West, 3 North, 3 East. Additional lock down tile rows, counting from the house walls: 2 South, 5 West, 2 North, 4 East. Additional lock down tile rows, counting from the house walls: 5 South, 3 West, 4 North, 2 East. Additional lock down tile rows, counting from the house walls: 1 South, 1 West, 1 North, 0 East. Additional lock down tile rows, counting from the house walls: 1 South, 0 West, 0 North, 0 East.